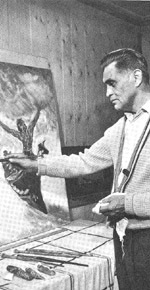 A painter, actor, author, and First Nations spokesman, George Clutesi was the first abo-riginal artist to gain widespread recognition in B.C. after Pauline Johnson. Clutesi's benchmark volume, Son of Raven, Son of Deer: Fables of the Tse-shaht People (1967), was published 54 years after Johnson's death. Although they had known one another only a short time before she died in Victoria in 1945, Emily Carr bequeathed her brushes, oils and blank canvasses to Clutesi in her will. Born in Port Alberni in 1905, George Clutesi endured residential school, worked as a pile driver, labourer and fisherman for 20 years, and took up painting and writing after he was injured at work as a piledriver. While receiving treatments in Vancouver, Clutesi met Ira Dilworth, Vancouver's chief executive at the CBC, who encouraged Clutesi to refine his writing for a series of CBC Radio broadcasts. By 1947, Clutesi, a father of five, was broadcasting aboriginal stories for young listeners on the CBC, province-wide. In 1947, Clutesi also began contributing inspirational essays on aboriginal culture to Native Voice. The newly formed aboriginal newspaper published transcriptions of Clutesi's "folk lore of the Seshaht tribe which have been handed down from father to son for generations. "; By 1949, Clutesi was sufficiently self-confident to hitchhike from Port Alberni to Victoria to address the Rt. Hon. Vincent Massey, chairman of the Royal Commission on National Development in the Arts, Letters and Sciences, during the Commission's two-day meetings at the Legislative Buildings. The pubication of Clutesi's Son of Raven, Son of Deer as an intriguing history. According to Gray Campbell of Sidney, when he heard about Clutesi, he went to the Port Alberni Indian Reserve and found Clutesi atop his house, fixing his roof. Understandably wary of white men in the wake of his experiences in the Port Alberni residential school, Clutesi would not come down off the roof. Campbell climbed up the ladder and they had a long talk. Almost a year later, Clutesi telephoned from the Vancouver Airport. He said he was thinking over what Campbell had said up on the roof. And so, with the assistance of a freelance editor, Clutesi's Son of Raven, Son of Deer became a cornerstone of aboriginal literature in B.C., published as a Centennial Project with Morriss Printing. Including 18 original illustrations, Clutesi's collection of 12 fables soon became commercially successful, leading the way for aboriginal writers in the second half of the 20th century. George Clutesi created a large mural for the Indian Pavilion at Expo '67 in Montreal, followed by a second book, Potlatch (1969). In his introduction to Potlatch, Clutesi claims the word "potlatch"; was derived from the Nuu-chah-nulth verb "Pa-chitle,"; to give, in association with the noun "Pa-chuk,"; in reference to an article to be given. It's one of various interpretations of the term. Clutesi appeared as an actor in three movies: Dreamspeaker (1977) directed by Claude Jutra; Nightwing (1979) directed by Arthur Hiller; and Prophecy (1979) directed by John Frankenheimer. Clutesi received the Order of Canada along with other awards and citations prior to his death in Victoria in 1988. A non-fiction book, Stand Tall, My Son (1990), appeared posthumously. George Clutesi's benchmark volume preceded two bestselling collections of oratory, My Heart Soars (1974) and My Spirit Soars (1982), by Chief Dan George of the Burrard Indian Band. His granddaughter Lee Maracle, a novelist, maintains Dan George directly narrated the words that appeared in print. Dan George's friend and biographer, Hilda Mortimer, has credited Catholic priest Father Herbert "Bert"; Francis Dunlop as Dan George's ghostwriter. Either way, a text credited to Chief Dan George was read aloud to the world during the opening ceremonies of the 2010 Olympic Games to represent the literary voice of B.C. 's First Nations. Born in Port Alberni in 1905, George Clutesi endured residential school; worked as a pile driver, labourer and fisherman for 20 years; and took up painting and writing after he was injured at work as a piledriver. While receiving treatments in Vancouver, Clutesi met Ira Dilworth, Vancouver's chief executive at CBC, who was one of Emily Carr's few close friends. Dilworth encouraged Clutesi to refine his writing for a series of CBC radio broadcasts. Although they had not known one another long before she died in Victoria in 1945, Emily Carr bequeathed her brushes, oils and blank canvasses to George Clutesi in her will. By 1947, Clutesi, as a father of five, was broadcasting traditional Aborginal stories for young listeners on CBC, province-wide. He followed Chief Dan George as an actor in films and he became the first B.C.-born Aboriginal to gain broad acceptance as an author of Aboriginal stories. In 1947, George Clutesi also began contributing inspirational essays on Aboriginal culture to the Native Voice, a newly formed Aboriginal newspaper. The Native Voice published transcriptions of Clutesi's "folk lore of the Seshaht tribe which have been handed down from father to son for generations. "; By 1949, Clutesi was sufficiently well-regarded and self-confident to hitchhike from Port Alberni to Victoria to address Rt. Hon. Vincent Massey, chairman of the Royal Commission on National Development of Arts, Letters & Sciences, during the Commission's two-day meetings at the Legislative Buildings. According to publisher Gray Campbell of Sidney, when Campbell heard about Clutesi, he went to the Port Alberni Indian Reserve and found Clutesi atop his house, fixing his roof. Understandably wary of white men after his experiences in the Port Alberni residential school, Clutesi wouldn't come down. Campbell climbed up the ladder and they had a long talk. Almost a year later, George Clutesi telephoned from the Vancouver Airport. He said he was thinking over what Campbell had said up on the roof. With the assistance of a freelance editor, George Clutesi's Son of Raven, Son of Deer (1967) became a cornerstone of Aboriginal literature of B.C. Including 18 original illustrations, Clutesi's collection of 12 fables soon became commercially successful. Clutesi promoted the book alongside Campbell who had conceived Son of Raven, Son of Deer as a Centennial Project with Morriss Printing of Victoria. Among the 61 titles Campbell released between 1962 and 1982, he also published Tales from the Longhouse (1973), a collection of stories for children, gathered from Aboriginal elders, on behalf of the B.C. Indian Arts Society. In 1967, George Clutesi created a large mural for the Indian Pavilion at Expo '67 in Montreal. In doing so Clutesi, as a painter and author, became the first Aboriginal artist to gain widespread recognition in British Columbia after Pauline Johnson. He followed his first collection of stories with Potlatch (1969), a work that dramatized the ritual of the potlatch. "You should have seen the old folks telling the stories when I was a boy,"; Clutesi once said. "They would act, dance and sing each part with changing voices. "; In his introduction to Potlatch, Clutesi claims the word potlatch was derived from the Nootka verb Pa-chitle, to give, in association with the noun Pa-chuk, in reference to an article to be given. It's one of various interpretations of the term. Again, an editor was hired by Gray Campbell to revise Clutesi's writing for publication. George Clutesi appeared as an actor in three movies: Dreamspeaker (1977) directed by Claude Jutra and written by Anne Cameron; Nightwing (1979) directed by Arthur Hiller; and Prophecy (1979) directed by John Frankenheimer. Clutesi received the Order of Canada and other awards and citations prior to his death in Victoria on February 27, 1988. A non-fiction book, Stand Tall, My Son (1990), appeared posthumously. Clutesi, George. Son of Raven, Son of Deer: Fables of the Tse-shaht People (Sidney: Gray's Publishing, 1967). Illustrated by George Clutesi. Clutesi, George. Potlatch (Sidney: Gray's Publishing, 1969; 1969; 1971; 1973). Clutesi, George. Stand Tall, My Son (Victoria: Newport Bay, 1990). Illustrated by Mark Tebbett. A nephew of Tseshaht artist and author George Clutesi, Randy Fred founded Canada's first Aboriginal-owned and operated publishing company, Theytus Books, in 1980, based in Nanaimo. Here Randy Fred shares memories of his Alberni Valley uncle who wrote Son of Raven, Son of Deer, a ground-breaking work published by Gray Campbell, the province's first trade publisher. I remember Uncle Georgie was so very gentle. His voice had a bit of a rasp due to tuberculosis from his younger years. He was quick to smile. His humour was subtle. He hated politics. He was not one to attend Band meetings as they tended to be so confrontational. He knew there was corruption in our office and felt powerless so avoided the issue as much as possible. His wife, Margaret, on the other hand, was always very forthright in her opinions. She was not afraid to call a crook a crook. Nevertheless, she, too, felt powerless and avoided the political arena. Margaret was simply honest. I used to chuckle to myself when I would visit her and she would be sitting in her chair knitting or weaving. With her hands moving steadily on her craftwork she could slam somebody quite harshly in her gentle voice. Uncle Georgie and Auntie Margaret lived in an unusual house for an Indian reserve. It may have appeared normal for a middle to high class neighbourhood anywhere else other than an Indian reserve. It had a long gravel driveway coming off the Pacific Rim Highway, which we used to know as Sproat Lake Road. Past the entrance to the driveway was a small shed where George used to paint, write, and meditate. The yard was quite large with a well manicured lawn, an abundance of fruit trees, berry bushes, and flowers. The house was always immaculately clean. I always felt intimidated walking along the driveway up to Uncle and Auntie's house. It seemed so out of place; so different than the other houses and yards on our reserve. My first real encounter with Uncle Georgie was in the Alberni Indian Residential School in the early 1960s. By the time I attended, the school was massive with a half a dozen or so large outbuildings, but it was a much smaller building during his schooldays. Being a creative soul with a great sense of humour, Uncle Georgie left the traditional Tseshaht mark on the school. Between the boys' side and the girls' side was an auditorium capable of holding more than 300 people. There was a foyer outside the auditorium door. This is where the rope was to pull the large bell to signal for mealtimes, church times etc. On the foyer floor George created a beautiful motif using the floor tiles. It was an image of a whale with a thunderbird on its back. This motif within a circle is what our tribe, Tseshaht, still to this day uses as our logo. I believe it was Uncle Georgie's way of marking the spot as traditional Tseshaht land. That piece of property has since been returned by the United Church of Canada to the Tseshaht tribe. Uncle Georgie could see what the Indian residential school was doing to our culture. He was okay about teaching kids from other nations our songs and dances. Later he started a dance group on our reserve. I recall Uncle Georgie asking me once why I had not joined up with his dance group. He told me I was Tseshaht and the dance group sang and danced to Tseshaht songs, my songs and dances. I was dumbfounded. I knew I loved the songs and dances. I did not know then I was feeling shame about being Indian. He never pressured me. Today Tseshaht people appreciate what Uncle Georgie did. However, in the beginning they ostracized him for his cultural work. Our people felt he was selling out our culture. This feeling extended further to his published works. When Son of Raven, Son of Deer was first published he was far from being a hero on our reserve. I admire him. He persevered. He published more books and got into acting and did well at it. Despite his fame he never looked down on any Tseshaht person. He was always welcoming. He was also forgiving. Slowly, the feelings of Tseshaht people changed up to the point of pride for his accomplishments. Now it is well understood he was instrumental in preserving and promoting Tseshaht culture. Uncle Georgie's trailblazing allowed me to work in communications. By the time I started Theytus Books Ltd, much of the jealousy towards him and the negative feelings about his work had diminished sufficiently. It was no longer taboo to share our culture. Like many creative people, George and Margaret had both been ripped off at times. It took a lot of convincing to finally get them to agree to allow me and Theytus Books Ltd. to publish The Art of George Clutesi. What a nightmare! George had entrusted all his written collections and archival materials to a supposed writer., a non-Native who had gained George and Margaret's trust. That project never did reach publication. She lied to us about her progress with the writing of the book. Like an unseasoned publisher fool I believed her to the point of mocking up a book and advertising it. What a heartbreaker! I don't even know if she ever returned the material to the Clutesis. I was glad Uncle and Auntie didn't hold anything against me for the failure of the project. Instead, our relationship drew closer. After that, I never felt intimidated entering that long driveway. In 2005 Randy Fred received the Gray Campbell Distinguished Service Award for his outstanding contribution to the development of writing and publishing in British Columbia. He lives in Nanaimo.